There, a little bit of Math & National Geographic. Indian Vanity Case.....Not All Make-up. YSL Rouge Volupté Shine ~ Give in to the temptation of dazzling color. Succumb to a unique sensorial experience with extreme comfort and luminous shine. Hyaluronic acid microspheres help seal in moisture for 8 hours of hydration. Anti-oxidants and emollients help condition and soften lips. Available in 19 shades. I'm showing the last one- #19 Fuchsia In Rage. Packaging ~ It's like a piece of jewelry (I probably have said this before). I can stare at it all.day.long. Any Dupes? Similar lippies are Maybelline Color Sensational Vivids Lipstick Hot Plum & Maybelline Color Sensational High Shine Lip Gloss in Raspberry Reflections. They are both not exact dupes, because they don't have as much purple. Price ~ £24 | Rs.2438. Yes, very pricey, but it's YSL. If you compare it to a MAC lipstick, you get the fabulous gold packaging for around Rs.900 more. 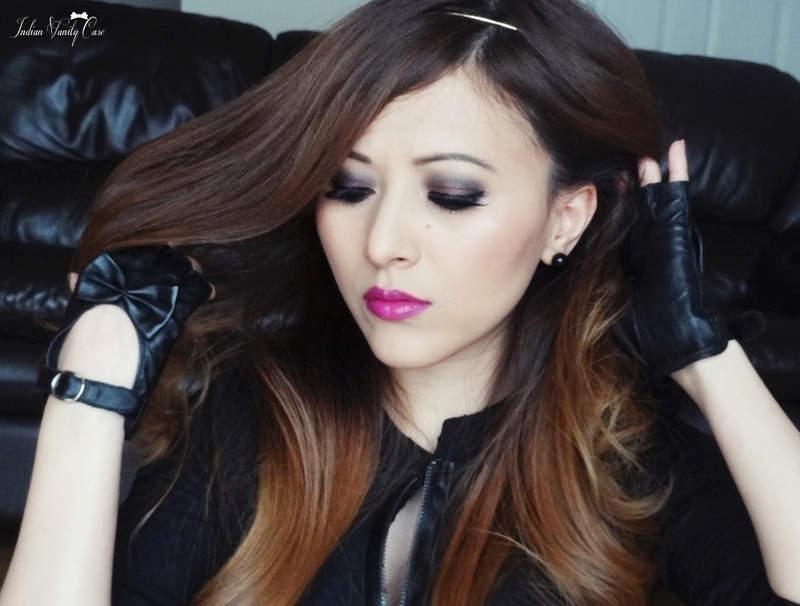 Totally showing off my bow fingerless leather gloves I got from Ebay. Love them to pieces! Just want to let you know my hair feels so much softer after using all the new hair care products shown here. Only used once so far. I'm giving away 1 of these lipsticks to 1 of you HERE. Go try your luck! What do you think of this shade? I will also post swatches of the other shade I got, Pink In Paris. P.S. Please don't mind the overly bright lighting in some pics, it's all the camera's fault. has a totally vampy look!! 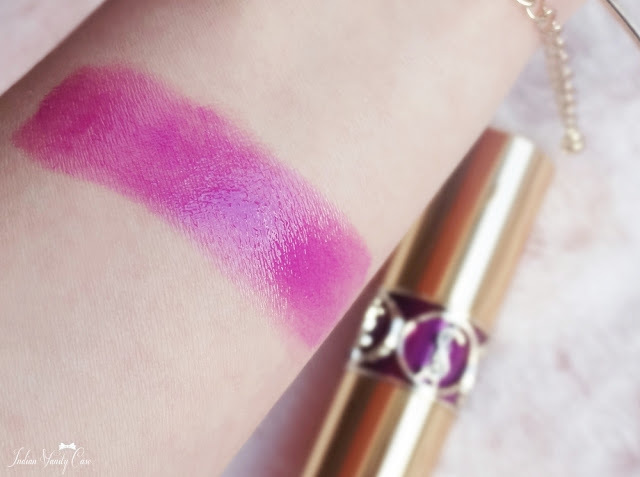 This lipstick remineded me of hot plum by maybelline...nd then u mentioned it too. Adorbs! Nice pics. :O :O Omg massive difference! I remember my original Rouge Volupte costing that much, but I thought they'd have increased a bit. I keep retelling stories that you write here to my boyfriend, and I can never stop gushing about how funny and awesome you are and your blog is, and one day he finally asks, "alright give me the link." He takes a look at the blog, and says, "omg, is she for real? Even the pointer is pink with a bow." And I say, "yes, going to her blog is like going to a girlie heaven." OMG!! I love this color!! Is my favourite!! Nice review! Love your hair and you C!! Lovely Shade!....I can never get that perfect eye makeup that you do... ! love the post..need more and more and loads more of these!! The packaging is so droolworthy.. the shade is so bold and such a gorgeous finish.. You paired it so well!! The eye makeup is stunning.. and your look.. Oh My My..<3 <3!! u look so stunning. can you please do a tutorial on your eyemakeup. UR blog is the best makeup blog that i have come across. Such a purply shade. And it goes along perfectly with your biker chic look. I knew this gonna look so good on you cynthia :) Soo pretty and totally glamorous ! Love it! Looks great on you! I'm waiting for Diwali, maybe then I might buy one for myself as a special treat :D.
You Look Damn Pretty As Always! And, What a B'ful Shade!! I lOve These Kind Of Purples! Btw, Where is YSL Available in Delhi,India? beautiful ! Absolutely beautiful CZ! never tried a purple on myself but u make me want to give it a shot!